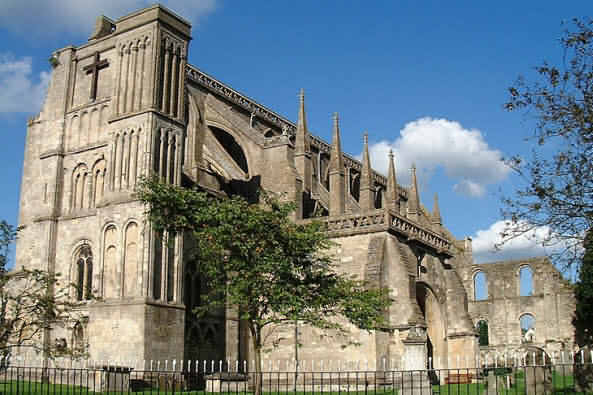 Much has been written about Malmesbury Abbey in the Wiltshire Cotswolds, its long history spans some thirteen centuries; it has survived the destruction of the monasteries by King Henry VIII, civil wars and much neglect. During the following years It was almost derelict and in the 18th century it was being used to store animal fodder. Full restoration began in the early 20th century and is now about a third of its original size and used as the parish church dedicated to St Peter & St Paul attracting many visitors. It is open daily 10am until 5pm. The Abbey is an important concert venue, it was the first to have an organ in England and now has a magnificent Dobson pipe organ and it is the burial place of King Athelstan. The abbey was founded as a Benedictine monastery about 676 by a poet named Aldheim who was the nephew of King Lne of Wessex. Aldheim was a talented musician and was known to play at any point that he could attract an audience and then having done so he would preach the gospel. It was however in 1010 that Eilmer or Elmer (there is a variety of spellings of his name), who was a monk at the abbey, attempted to fly. He was known to have read the Greek fable of Daedalus and it was his belief in the fable that influenced him to make the attempt. He had observed how Jackdaws would circle the area swooping and gliding , he calculated how to make use of the air currents after which he constructed wings, the material of which is not known. Fixing the wings to his wrists and flapping them as a bird would, he leapt from the abbey tower, he was successful in travelling a distance of 200 metres but panic set in and he crashed to the ground breaking both legs. The venture crippled him for the rest of his life, although he was so badly hurt it did not deter him from making preparations for a second flight. The news of his second attempt came to the notice of the Abbot who banned him from any such efforts. Eilmer was seen around about Malmesbury for many years after his escapade , he lived until the age of 88. A stained glass window was installed in 1920 in memory of Rev.Canon C.D.H. McMillan who was vicar of Malmesbury 1907 to 1919. It shows Eilmer with wings in his hands. Hannah was known to be poor and there is much speculation as to how her grave and tombstone was paid for, one of the theories being that she had a wealthy lover and that he provided the funds. There is much of interest to see in the abbey and the area in close proximity and holds much appeal to visitors. Amongst these attractions are the Abbey Gardens, these are privately owned and are reputed to have the largest rose gardens in England.